Staub Cookware has been creating enameled cast iron casserole, cocotte and ramekins since 1892. 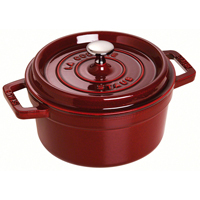 Staub cookware is beautifully designed and made in France by Europe's cast iron cookware expert. The cast iron in Staub cookware allows for even heat distribution and retains heat long after it has been taken off the stove. It is perfect for slow cooking meals. A special smooth ceramic bottom enables it to be used on all types of heating surfaces, including induction. Staub cast iron requires no seasoning! Oils used when cooking penetrate the pores and create a natural, smooth non-stick surface. 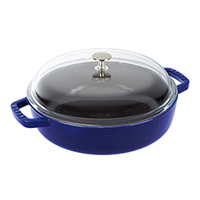 Staub makes a variety of unique cast iron and ceramic cookware. 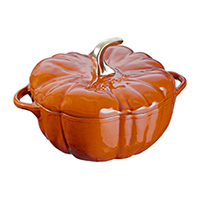 You'll love the look of the two cast iron casseroles shaped like a tomato or a pumpkin. A practical vertical chicken roaster, universal chefs pans and a unique cast iron loaf pan round out the latest specialty items from Staub. The Staub Round & Oval Cocottes, also known as dutch ovens, are the perfect cast iron cookware for your kitchen. These useful serving pieces, Staub Cocottes are available in a variety of colors. The Staub Universal Pans is the perfect cast iron cookware for your kitchen. A great serving piece, the Staub Univeral Pans is available in a variety of colors. A must for every kitchen, Staub cast iron fry pans feature a smooth enameled bottom that will not scratch delicate cooking surfaces or countertops. 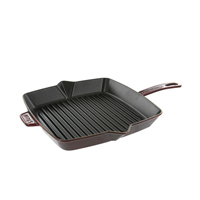 The Staub Cast Iron Grills create the taste and look of outdoor grilling on your stove.